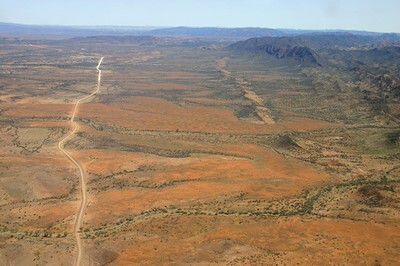 I am in the early stages of planning a trip from Perth to Darwin via the Great Central Road/Uluru in March 2008. I have visited 40 USA States so am no stranger to driving thousands of miles. I normally simply use a full size hire car (like a Chrysler 300) but feel that Australia would probably require at least a 4WD. A motorhome is always a possibility but I would rather stay in motels. I see that between Perth and Uluru there are settlements named Northam, Merredin, Southern Cross, Kalgoorlie, Leonora, Laverton, Warakurna and Kaltukatjara. Could you possibly tell me if these settlements have motels or hotels? Alice Springs to Darwin appears to be a much higher profile highway (on Google Maps it has shields and a lot more settlements) than Perth to Uluru. Is this the case? What is your opinion of campervan travel through Australia? Would air conditioning be necessary in order to sleep or does it get cold at night in March? Hope these are not too many questions but I am getting very excited at the prospect of my trip to Australia. You can never ask too many questions before a trip like that :-). Let me tackle them individually. "Alice Springs to Darwin appears to be a much higher profile highway than Perth to Uluru. Is this the case?" You can't really put it that way. On your way from Perth to Uluru you will pass through many different regions with many different levels of facilities and different quality roads. The drive from Perth is all bitumen up to Laverton, and most of the "settlements" you mention are sizeable towns with full tourist facilities. You will find many options for accommodation. The only part of the trip you need to be concerned about is from Laverton to Uluru. "I normally simply use a full size hire car (like a Chrysler 300) but feel that Australia would probably require at least a 4WD." Australia doesn't require a 4WD. However, there are of course regions where a 4WD will let you see more (get off the beaten track) and there are some roads that do require a 4WD. The Great Central Road between Laverton and Uluru is a sandy track through extremely remote desert country. It is well maintained and, provided the road is dry, can be done in a 2WD. But a 4WD will make the trip a lot safer and more comfortable. "Could you possibly tell me if these settlements have motels or hotels?" I wouldn't call them motels or hotels, but you can get basic accommodation at the roadhouses: Tjukayirla, Warburton and Warakurna (double check about Warburton, not 100% sure about that one but they definitely have a campground). Kaltukatjara has only campsites. And, as I already mentioned, up to Laverton and onwards from Uluru you are in the middle of normal civilization with all the usual facilities. With proper planning it's easily possible to do the whole trip without camping. "What is your opinion of campervan travel through Australia?" Hiring a campervan is in my opinion the best way to see Australia, but that's because I love camping and staying in remote places away from all the facilities. If you prefer to stay in motels anyway then it seems like an extra expense that offers no additional benefits. "Would air conditioning be necessary in order to sleep or does it get cold at night in March?" Depends where you are. Darwin is over 3000 km further north than Perth. The Great Central Road passes through Aboriginal lands and you need transit permits, one from the Western Australian authorities (ALT, apply here) and one from the Northern Territory authorities (CLC, apply here). The ALT can request the permit from the CLC on your behalf. The permits are free. The other thing to keep in mind is that, as I already mentioned, March is the tail end of the wet season. The further north you go the bigger the chances of substantial rains and even flooding. Keep an eye on the road conditions and weather forecasts, and make sure that you are a bit flexible with your schedule. I hope that answers all your questions (don't hesitate to use the comments section if you have more) and gives you a good idea of what to expect. Many thanks for your comprehensive response. I have done a great deal of research on various types of trips in the past (e.g. I drove 5,000 miles around Canada and Alaska in June this year), but I have never come across a service as good as yours. I have great confidence in your word and will organize anything I need to (visas, Aboriginal Permission etc...) through your wonderful site. Keep up the good work. Truly, truly superb. Thank you very much for the kudos :-). I'm glad you found the answers useful. My question is similar to Martin's and you have covered a lot of what I had in mind to ask. I am flying in to Perth in August, and a rough plan I have is to travel up the west coast to Darwin and then into Uluru, and then making my way to Sydney for Christmas. This is my first port of call so sorry for only a brief outline, but I was hoping for some advice on the best/cheapest way that this route could be achieved. I would love to go off the beaten track a little and camp, although having never driven in this type of terrain, I would be a little apprehensive but more than willing to give it a go. I would say I have pencilled in about 4 months to do this, any advice or suggestions would be greatly appreciated. Four months sounds like an excellent time frame for that trip. Up the west coast, back down through the centre and across to Sydney also sounds like a great route to me. I would not worry too much about the driving. There are many off the beaten track locations that don't require great skills or anything. The reason that they are "off the beaten track" is that most people just rush through this country and don't have the time to see much. I don't know how you plan to get around and can't say much regarding costs. Not knowing your budget and not knowing what style of travel you are thinking of I can't say anything. I do have one tip for you, and that is to download the free Kimberley guide booklet from my other website. That will tell you a lot about the far north and I think you will find it a great help at this stage of planning, at least for that part of the trip, but also for a few overall ideas. I'm a spanish guy, and i would like to do this road. Unluckily i don't have so many days, just around 3 weeks, and i would like to know approximately how many kilometers there are between Perth, Uluru and Darwin? I did a calculation that maybe would be around 4000km, but maybe you can tell me better. Another question, is about the nowhere land between laverton and uluru.... Is there something to see or is just 3 or 4 days with the same landscape? Thank you very much for your answers!!!! Your calculations are about right. It's about 950 km from Perth to Laverton, 1100 km from Laverton to Uluru and about 1960 km from Uluru to Darwin. You can drive the Great Central Road in a 2WD, but if you hire a car you are not allowed to. The hire companies won't let you drive 2WDs off the tarmac. It doesn't necessarily take 3 or 4 days to drive from Laverton to Uluru. It's up to you. Hi I was reading the other readers comments and found that no mention of fuel stops were mentioned between Perth and Uluru. what would the average distance be between stops,or is it something i shouldn't be worried about. I was planning on going the central route from Perth on my motorbike (GTR 1400) but i guess that sandy track would put that idea out. Could I go coastal then cut across to Uluru. I hope to go on this trip with a few biker friends from the UK in the first or second week of April. Any advice you could give would be greatly appreciated. Which route are you talking about for fuel stops? For fuel supply points on the Great Central Road see this page. With a road bike you'll have to stick to the coastal route. Yes, there are service stations on our highways. 200 km is the average distance. On occasion it may be slightly over, but not much. I have no idea what the range is of such a bike, so if that is getting close, get a map and verify the exact distances. My gut feeling is you don't need to worry at all. First of all I have to say job well done creating this resourceful website! It has seriously saved me lots of trouble preparing for the trip from Perth to Uluru. I'm extremely grateful. Could you give us a few advice on what maps we should get and any other comments or feedback will be very much appreciated. Once again thanks B and others!!! Thanks for the kind words. Glad you find the site helpful. Well, whether October is good depends on how you define "good". It shouldn't rain, but it will be scorching hot in the centre. Hopefully you won't need half of the stuff you are carrying. The Great Central Road is unsealed, but it isn't a challenging desert crossing. It's a perfectly good road, just not yet sealed. You are very well prepared. I normally stick with the maps by HEMA. The Red Centre map plus the WA handy map would probably be all you need. If you wanted to do some more serious exploring you could get some of the desert track sheets. The NW central sheet for the area round Uluru, Kings Canyon and the McDonnells, and the SW sheet for the Great Central Road. I only just saw the line about the few additional "off the beaten tracks". Doesn't really change anything. I wouldn't say you are over prepared, just very well prepared, as you should be. If you do venture off the main roads somewhere, make sure you let someone know where you are going and when you want to be back, and take enough water. That, plus staying with your car if you get stuck, are the most important rules. But as long as you stick to the usual destinations and tracks you should be fine anyway. "Close to" Uluru is Mt. Conner I will remout this - is good idea or no? In the End: This page is excellent for tip to trip! Thank your for your answer! I think the Great Central Road should be passable for 2WDs, provided it is dry, which it should be that time of the year. Do check the road reports at the time, just to be safe. And note that passable does not mean taking a 2WD is a good idea. It just means it's not impossible in a 2WD. The corrugations can get pretty bad and you may hit some sandy spots. Tyres may be another problem. Also, are you driving in your own vehicle or a hire car? Hired 2WD vehicles are not allowed on unsealed roads. Sorry but I did not understand what you meant with your question about Mt. Connor. I would not recommend that anyone attempt the Great Central Road in a car. It is extremely rough in places and feel the experience would not be as enjoyable as it would with a 4WD. That being said, the journey is not as daunting as people make out. It is AWESOME but not daunting. I drove from Sydney to Perth via Uluru and it was a heck of a lot easier than I expected. I would recommend a satellite phone or EPIRB as you simply do not see anyone. One day, I only saw two vehicles. You will see thousands of WRECKED vehicles though. The Outback? Wow!!!!! It is like looking out to sea at the horizon but it is land not water. Excellent. Enjoy. I don't recommend cars too. There is a reason why there are literally hundreds of abandoned cars littered all over the desert. If it's car or nothing, then I would choose car :) Just make sure you STAY ON TRACK. You might be tempted to drive in a little especially when looking for a place to pitch your tent but don't do it with a car, I nearly got bogged a few times in my 4WD. Oh yeah, make sure all bolts and nuts are tightened and suspensions are checked before you head out. The corrugation busted 2 of my tires, my UHF antenna, and a piece of metal that keeps the exhaust pipe in place. You do know that it's wet season now do you? Get yourself a 4WD if you can :). I would like to take the western coastal road from Perth to Darwin in august/september. Would I Need a 4WD for this? since I will be studying in Perth for 6 months prior to this I have planned to persue my own car. However 4WD are more expensive and I remain a poor student. Would you advise me to by a 4WD anyway or would a normal car be satisfactory for this trip? A car would be fine as the entire route is paved. We are planning to travel with a Mazda B250 Ute pulling a dual axle caravan 17ft from Uluru to Laverton the first week of December. Some comments would be appreciated on whether this is possible and what we should be aware of. I live in Perth and have a ford escape and will be towing an semi off road camper trailer. We are looking at travelling the Central Highway across to Uluru and then up to Darwin and back down the west coast to Perth. My biggest concern is fuel as the Escape is unleaded. I have heard mixed reviews on whether Opal Fuel can damage or affect your engine. As this is the only fuel available in some the communities. Also any idea of price of fuel on the central highway as we are trying to price the trip. Great site well done! May I add to every one who asked questions. As a person who had just driven all around...please, if possible try to stay off the roads at night. The animals are out and they do a lot of damage. So you drive from sun up till just before sunset and find yourself somewhere to rest and rest. It can get hot and dry but you'll see more anyway. And it would save you a heck of a lot of money if something went wrong. the roo's were in the thousands and I was in tears the entire way. There were none the trip before but the trucks were just taking them out. For a car however, you wouldn't stand much of a chance. So please, every one save the animals and yourselves. Stop at night and enjoy the sights. On behalf of the roo's....thank you. And please, every one, not that any thing will happen, but its always nice to be comfortable so always take drinks in the car and a first aid kit and plenty of sunblock for your arms and legs sitting and driving all day. The Aussie sun is hot, much hotter than some places (still very nice though), and mozzie repellent. They are the basics for a trip like this. Steve, the price of both petrol and diesel is around $2 to $3 per liter, which is double of what you normally pay in metro area. Slightly cheaper in Alice springs, but still dearer than big cities. Friends have suggested we travel with them for 2 weeks in July when children have school holidays in a return trip from home in Perth to Uluru. They have 4WD with camper trailer, we have a 2WD with camper trailer,(Hyundai Trajet 7 seater) which we used for Karijini trip. Can it be done? We have little experience traveling these sorts of roads, and with 3 kids don't really want things going wrong. However it's the only vehicle we have. Your advice? What is there to see/do along the way to engage the kids? Appreciate your thoughts. I would not consider this journey in a car as totally unsuitable, especially with children. You would be getting into trouble. You need 4WD at a minimum. Wouldn't think a trailer is suitable either as it would do nothing but jump around. Hope this helps. First of all, congrats on an excellent and informative webpage. I love reading people's comments and feedback, makes me feel even more excited about my Australian adventure than I already am. Since most of my questions have been answered already, just a quick logistics question. Our first port of entry will be Perth and we want to travel the Great Central Road up to Ayers Rock (and probably go to Sydney via air from there). Is there any way for us to rent a 4WD Laverton? I couldn't find anything that seemed reliable online. We really just want to skip driving from Perth to Laverton. In case we have to rent from Perth, how long does it take to drive from Perth to Laverton? I note that someone was considering do some dirt roads on a Kawasaki GTR1400. Yes I have seen people on the older GTR's go on some pretty rough roads but be prepared to have the fasteners work loose and even bits drop off if not properly prepared. Sand tracks on a big road motorcycle are a NO No unless your a masochist. On a warm day after you've lifted the bike and all that luggage up a few times you will be knackered. Try some of these off road bikes if your serious. The Triumph 800 The newest kid in the off road group, the BMW 650/800 but Fettle it first on a road trip. The KLR 650, Good MPG with a 23 litre tank is an excellent choice and much cheaper for a one off trip. The Suzuki 600 (air cooled) but get the bigger tank and the Honda 650/700 v trans-alp twin off roader. Note that some of these bikes will drink more heavily when pushed or running constantly against the wind so check them out before you go. In the Pilbarra from Paraburdoo to Nanutarra it's almost exactly 300 kilometres of exceptionally good bitumen with no fuel stops. I have done that on the same road bike 6 times and fuel consumption has ranged from 13 litres to 20 litres, running of air. It's the wind and the right wrist activation that makes the difference. Traffic can be very sparse so Carry a little extra fuel say 5 litres and top up the tank as space becomes available. Helps make the bike a little more manageable and stops getting covered in fuel if you happen to puncture your (specified) fuel container in a fall. I agree this website is really helpful. Thanks everyone. Just my question is: can I do the great central road with a campervan in end November/ beginning of December? I guess this road is wonderful but can be quite dangerous as well so I would like to be well prepared to do this trip. Are those 2 months in the wet season? My campervan is a Toyota Hi Ace 1983 in good condition but i don't if the road is too rough for this kind of vehicle? Thanks for the answer and congratulation for this website! I once drove with my young family from Darwin to Perth via Port Augusta. The scenery for the most part being mile after mile of mind numbing incredible scrubby vastness. Alice Springs was a broiling furnace that brought to mind Dante's Inferno. Or the Vanity Fair of John Bunyan's Pilgrims Progress, for the people had a marked arrogance, cocksureness and, one sensed, confident impunity. In Coober Pedy, a snickering local cop proudly exhibited-to our disgust- an aborigine housed in a bell shaped cage that stood in the police station's back garden. We saw "Lake" Ayre that actually and unusually had water in its basin. After rattling and bumping in a straight line over endless corrugated unsealed road surfaces, we finally arrived at our destination, still vibrating from a never to be forgotten experience. However, I am grateful for one thing. We left Darwin just before a cyclone levelled the town at Christmas time in 1974. Hi, we were looking at travelling Perth to Uluru via the great central road. We have a Toyota land cruiser Prado and a coromal pioneer silhouette 4x4 camper trailer. Is the journey feasible with a camper trailer? We are looking at doing Perth to laverton in a day and then tossing up whether to break the next journey up at Warburton or push on to Uluru. Is laverton to Uluru possible with long days driving? What is the estimated drive time? We have 2 spare tyres for our 4x4 and camper trailer but were wondering whether any other recovery gear is necessary? A day from Laverton to Uluru? I would say no chance whatsoever. I think you should slow down and do more research. The Great Central Road is brutal and should be treated with much respect. Not sure about the trailer. Very, very rough road. Maybe only see two or three cars per day. Did this in Jan this year, carried spare fuel but didn't use it, left Perth to Alice springs and then on to Brisbane, all in 1 week.. Didn't see much, just wanted to see if it could be done, and how easy it was. No problems, apart from a snake under my tent when I packed it up, but he was friendly, we are heading back again in the wet season to make it more interesting, and hopefully see more. Is 10 days Long enough? Would Dec be a good time? Hi, I find all the responds are super helpful. I'm planning a trip from Perth to Uluru in End of Dec. I have 10 days. I'm planning to drive there as I quite enjoy desert view. This would be my first time and I'll be traveling alone. I tried looking at flights but there's no direct flight to Uluru from Perth. I'd be wasting my time to transit in Sydney. 1. Would you think 10 days enough to drive from Perth to Uluru and then back again? 2. Do you think it's safe for me to drive alone? 3. Will December weather be good for this? Though this website covers all my queries but still wanted to be very sure as this would be my first 4000 kms road trip. I am moving to Darwin from Perth in Mid January so was wondering if I can drive my Toyata celica via the costal road towards Darwin. Are the roads good on that route? Also is it safe as I vl be by my own. We finally did make the trip across the great central from perth to Uluru. We made the trip in a Toyota landcruiser prado with a pop top coromal off road caravan. Did the Perth to Laverton in 1 day and the Laverton to Uluru in just under 22 hours with stops for meals, refuelling and stretch breaks as we had 2 young kids to keep amused on the journey. Max speed was 80km per hour on the better stretches of road and min speed was 20km per hour- mainly on the section between the Northern Territory boarder and Uluru. In terms of wildlife we saw 1 camel and 1 wild horse. The road was well travelled during the day with plenty of road train activity but traffic on the road stopped after around 10pm. Things to note are that fuel stops are few and often close by around 3pm particularly on weekends. We carried extra cans of fuel and this in combination with our long range fuel tank helped us make the journey. We heard mixed reports about stopping overnight to camp in the free camping areas so decided that our safest bet was to drive slowly throughout the night changing drivers every few hours. Great little adventure!! hi, friend. i am planning to drive to darwin from perth and i got 2wd 1.5 engine 6 year old and done 150000 km so please advise me is that safe to drive 2wd. Is a 4x4 really necessary? When I was younger we used to travel to and from Perth across the Nullarbor when it was dirt from Port Augusta through to Norseman in a VW beetle without so much as a hint of trouble. The last of the trips it was still unsealed from Ceduna to Eucla in a Holden EH wagon. We used to do road trips in a ute across the then unsealed Omeo highway. Much of the Birdsville and Oodnadatta tracks were done in 2wd vehicles. The difference between now and then is the cars used to have normal profile tyres and 6" of ground clearance. Does the Great Central Road really require 4x4 or can it be done in a properly prepared car? Brian, for someone who knows how to drive on such roads, with decent tyres and enough clearance just as you mention, it can certainly be done in a 2WD. I also wrote that in my answer to Martin above. I also do mention frequently in my guides and through the sites that even on the much rougher roads it's rarely the 4WD that you need. Tyres and most of all clearance are the limiting factors. Planning the Great Central Road in a cheapo old Falcon or Commodore wagon purchased in Perth especially for this trip, with ball n chain and two trailers (!). I've got some long-distance driving & some off-road experience (almost exclusively in bombs) plus years of professional driving (so, excellent at stringing kms out of those litres). Since Birgit continues to say 2WDs are OK depending on car, I'd like to ask OZ V6 fans which (leaf spring) ones fit the bill. Age shall not weary them, but the price shall condemn. Hi. We are heading to Laverton, intending to do the GCR in a week or so. We have a Land Rover Discovery with standard road tyres and towing a 21ft semi off-road van. Any comments or suggestions on how we would manage with these rigs or anything we need to be aware of when towing a large van. Do many tow vans across? Thank you very much for the very informative and well set up web site. I love reading all those comments. I would like to have a recommendation for three locations to sleep over night between Perth to Uluru via Great Central Road. Please let me know if you have a better idea. We left Uluru Friday morning and got into Perth 4am Sunday morning - we towed a caravan and did one overnight stop. We saw lots of camels and we also saw some lone cyclists. The road was a mix of bitumen/small stones and gravel/sand. At times we did 100ks an hour and at other times 30ks an hour. Despite lots and lots of ripped tyres on the road we didn't get any issues but we were prepared with puncture repair kits. Everything gets a good shake so make sure you check everything is good and right afterwards and be prepared to be cleaning the red dust for a while after.